As if our scene just isn’t popping enough during this spectacular football season, we’ve counted a total of three huge events happening all this weekend. 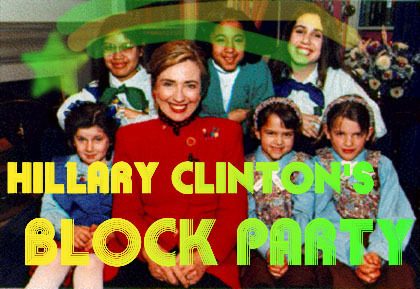 For one thing, current Senator and 2008 presidential election primary candidate Hillary Clinton has decided to drop by on Sunday and throw an old school street fiesta . Her goal: to assist us Cal students in getting crunk while the Bears are out of town. Of course, Senator Clinton’s list of things to achieve while here probably also involves mobilizing many Bay Area citizens–including the 18-24 set (hey, that’s us! )–out of voter apathy and out of voting for Obama. The block party will celebrate good times on Sunday in nearby Oakland from 4:30-6:30 p.m. and will feature surprise local entertainers. Since it’s Oakland, we’re half-expecting the hyphy movement to show up. Feel like block party hopping? Competing with Hillary’s appearance on Sunday is the 12th Annual “How Naked Berkeley Can You Be”  parade and festival in Civic Center Park. Before that, however, be sure to get your rave on at San Francisco’s 2nd Annual Love Fest this Saturday. It’s modeled after Germany’s Love Parade, so you can expect lots of touching, lots of feeling–and most importantly, lots of ecstasy. We here at the Clog urge you to take advantage of the randomly abundant celebrations now. Come Halloween, our beloved, violent costume-partying at the Castro  may no longer exist.